Luke Mangan is one of Australia’s leading chefs and restaurateurs with a number of award-winning restaurants in Australia and overseas. While Luke’s restaurants range from casual to fine dining establishments, they share the common thread of Luke’s cooking philosophy – which is to source the finest and freshest local Australian ingredients and showcase them with a clean and contemporary twist. Luke is renowned for his unexpected creations, which highlight his French classical training and Asian influences, married with simple, fresh, clean flavours. 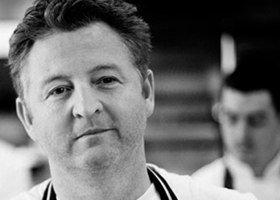 Luke’s cooking aims to enhance and accentuate, rather than mask the natural taste of the ingredients. Flathead is a fish commonly found in Australian waters, with 5 main varieties sold on the market. They are most often caught in NSW, Victoria and Queensland. Slow cooking, particularly of larger species, will prevent a dry texture. The mixture of sweet, salty and citrusy zing in this salad guarantees satisfaction at the table. Long, slow cooking of pork allows the meat to develop a soft, inviting texture. Don't be put off by the extra time preparation necessary; it will certainly be worth the devotion. This recipe can transform your leftover lamb roast into a delicious entrée. Use any mushrooms you have or like and experiment with different herbs.